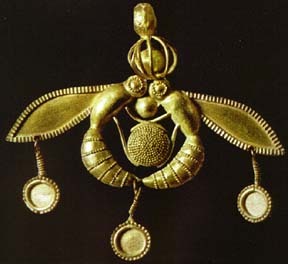 Something that happened around 1500 B.C. was very significant to our studies. It was a cataclysm that affected people around the entire Mediterranean and may have been the greatest catastrophe in history, short of the Great Flood itself. It was the eruption of the volcano on the island that is currently called Santorini, but in ancient times was called Thera. The people who lived on this island in 1500 B.C. 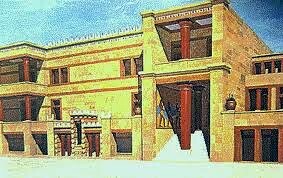 were called the Minoans. 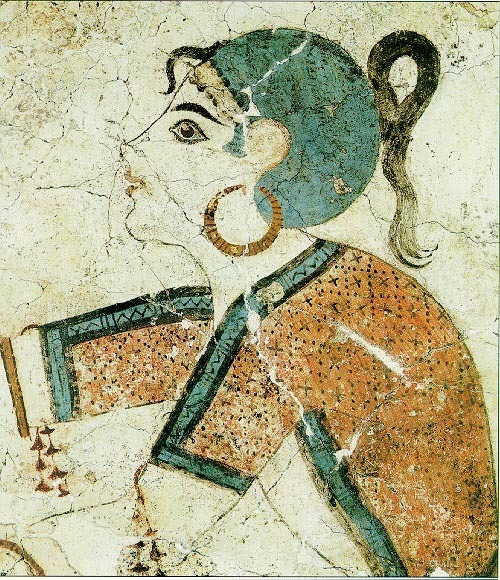 You may have heard of the Minoans before. 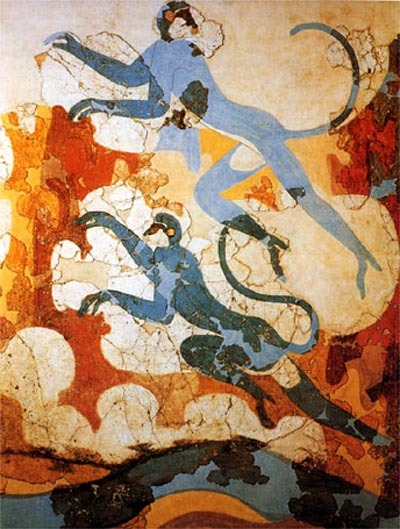 The stories of King Minos, the Minotaur and the Labyrinth, from Greek mythology, are all about them. This is what we do know (and there is more being uncovered every day). 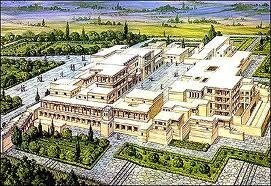 Below is the reconstructive drawing of the palace at Knossos. It is a maze of rooms that is probably the basis for the legend of the Labyrinth. It has over 1,300 rooms and was the size of four football fields. To give you some perspective, the White House has 132 rooms and we think it’s big. 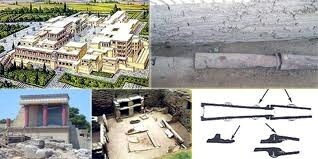 The other Minoan towns had three and four story buildings, with running water to the top floors of the residences (yes, uphill) and a mechanically sophisticated sewer system. They had functioning bathrooms on the fourth floors of their buildings and in the common people's homes, not just nobles' palaces! 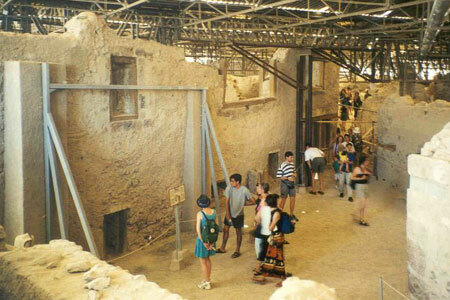 The photo below shows the excavations of the town of Akrotiri, the only completely intact Minoan town found on Santorini. It is buried beneath dozens of feet of pumice and volcanic ash. 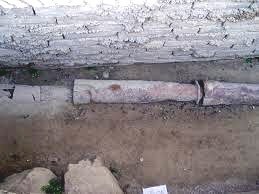 Our European culture didn't come anywhere near that level of plumbing until 3,400 years later, in the 1800's A. D. Until then, we (the most advanced civilization on the planet) were throwing our sewage into the streets! 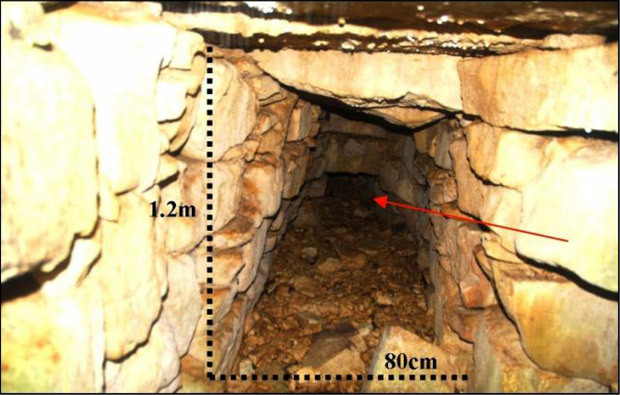 A portion of the Minoan pipe system that was able to pump water (without mechanized pumps, using the Venturi effect) up hill, to bathrooms, kitchens and fountains. The construction of the buildings incorporated a combination of timbers and brick or stone, such that they were earthquake resistant. 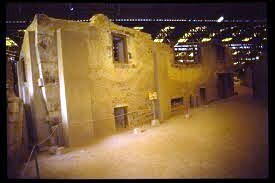 They had a very advanced system for conducting and modifying light and airflow to interior rooms of their buildings. Their palaces were covered with polished gypsum, that shown like silver in the sun, mentioned by Plato, in his descriptions of the Atlanteans. 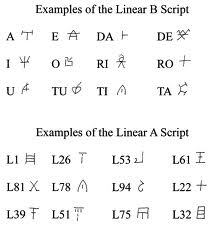 They had two complete alphabets, only one of which we have deciphered. One of them looks very much like the First Tongue that we've discussed in this blog before. Remember Genesis 11:1, where the Bible tells us that all people had one language. Their sculptures and paintings are very complex, very skilled and very life-like, unlike anything else known in that era. The Minoans had huge trading and military fleets and their artifacts are found all over the Mediterranean. Their main bases were on islands in the middle of the Mediterranean Sea and they themselves possessed superior fleets of ships, in both technology and number. This made them almost unassailable to any other culture at the time. 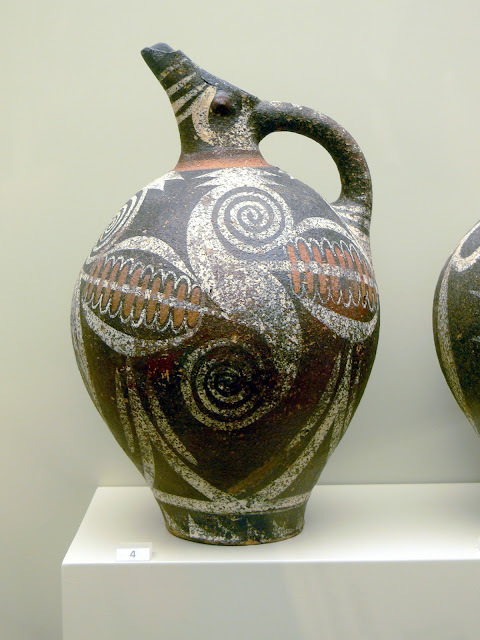 The Minoans dominated the entire Mediterranean coastal region with their navies. 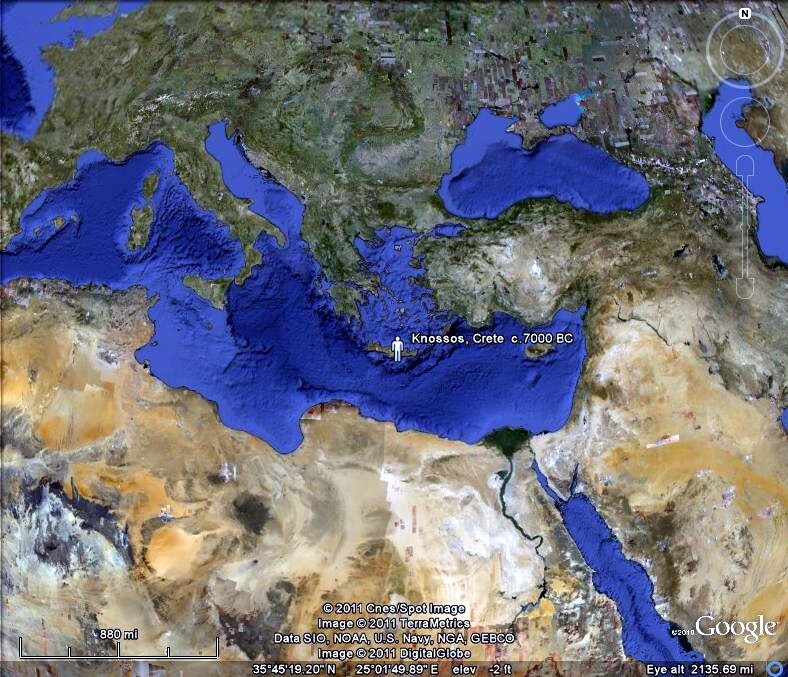 The Egyptians said that they ruled all the nations on the Mediterranean Sea, west of Egypt. They were the only people that the Egyptians of the Pharaohs considered civilized and on a par with their own culture. 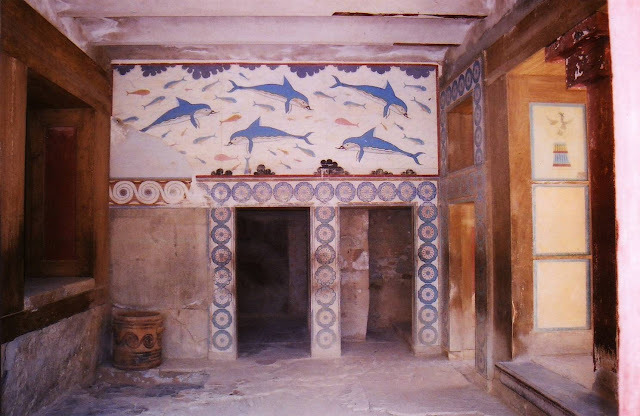 There is a city that the Minoans built on the Egyptian coast where their trade and diplomatic delegations carried on regular business with Egypt. 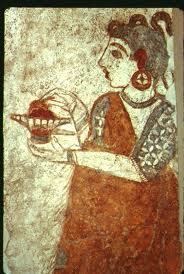 Much of the art and technology of the Minoans and the Egyptians was obviously similar. 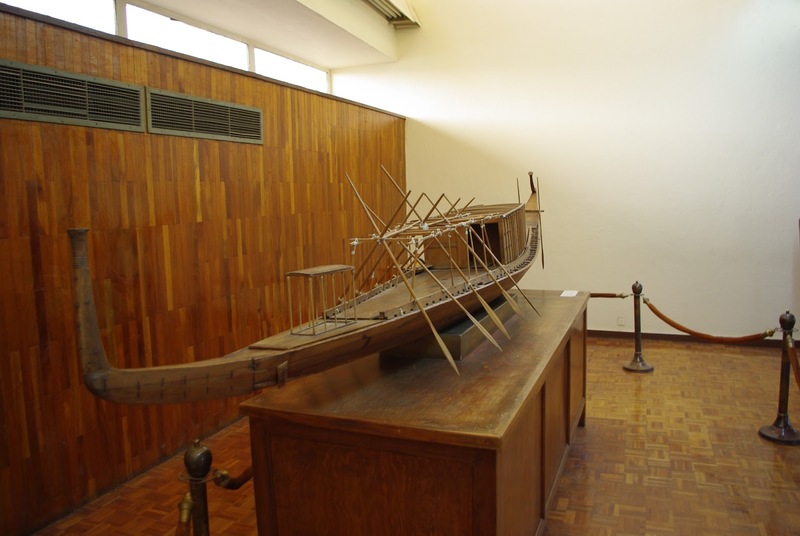 The boats that have been found buried near the tombs of the Pharaohs were quite obviously either built by, or were based on, the designs of the Minoans. 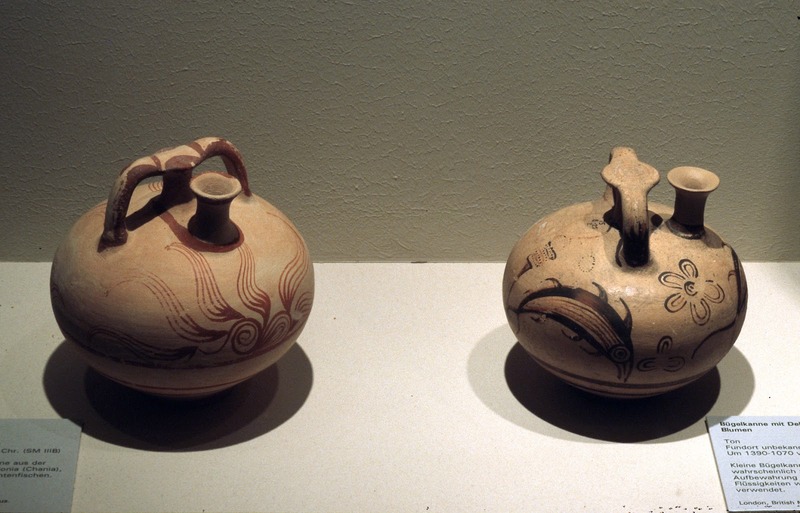 They look almost exactly like the ones depicted in Minoan artwork. See the model of the Egyptian boat photographed below and compare it with the drawings of Minoan ships above. There was a reason for this bond between Egyptians and Minoans . 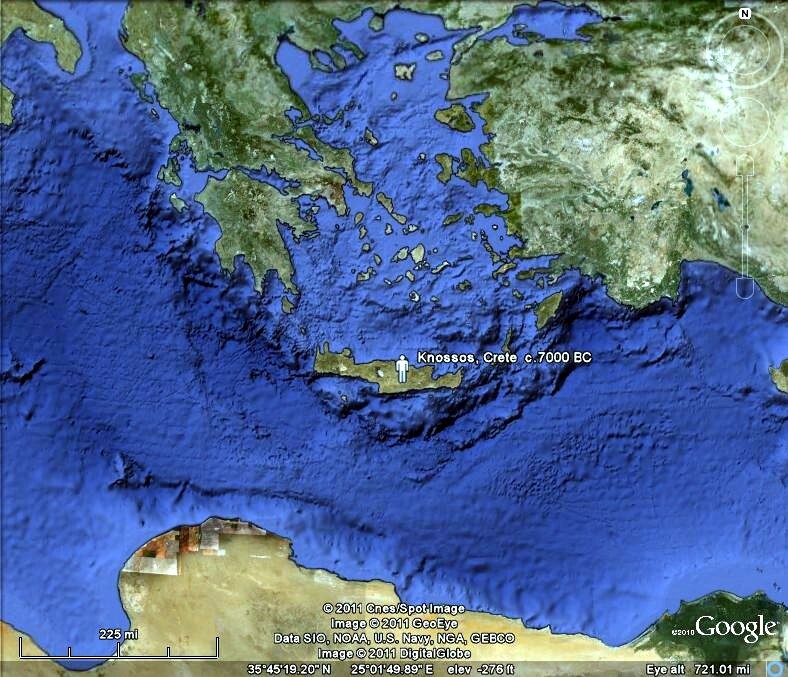 We don’t know where Plato got the name “Atlantis” or “Atlanteans.” We don’t know what the Minoans called themselves. 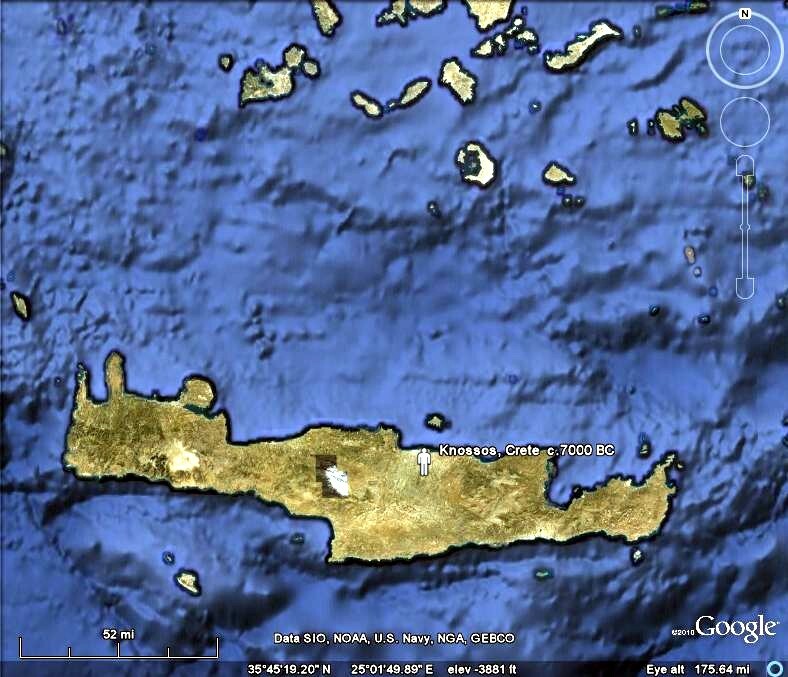 In the Bible, the island of Crete is called “Caphtor” and the people who lived on it were called “Caphtorites.” The Egyptians called them “the Kefchu,”or "Keftiu," obviously a related word, which was also their name for the island of Crete. I think that these, then, are the Atlanteans. The legend of Atlantis first came to Western culture from the writings of Plato, in his works called “The Timaeus” and “The Critias.” He tells us that his grandfather, Solon, (c. 638 BC – 558 BC) the Greek philosopher and lawyer, was able to interview some learned Egyptian priests of On, who told him about a place that Solon called Atlantis. We won’t go into great detail here, but suffice it to say that the story tells of a great people who lived on an island in the Mediterranean. They were very advanced and possessed many wonderful machines, cities and abilities. 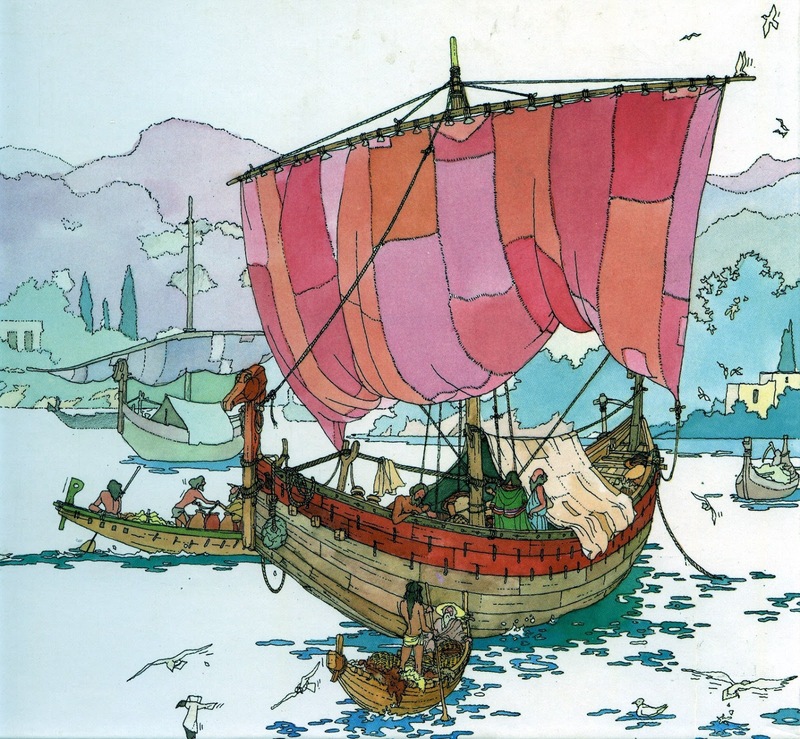 They lived on an island that was circular in nature and had a series of canals in 3 concentric circles, with canals connecting them to the sea and large causeways to move the cargoes from the docks. They were ruled by a council of 5 kings. They ended, though, when their island sank into the sea, “in a day and a night,” with fire and smoke. The end of the story says that this happened about 9,000 years ago. That "9,000 years ago" thing was and is confusing a lot of people. 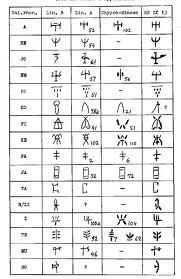 Then archaeologists found in an Egyptian wall inscription telling the same story, nearly verbatim. The interesting thing is that the Egyptian number for the number of years since this happened was 900, not 9,000. Solon had apparently misinterpreted the numbers. If you add the date that Solon heard this story (say, around 600 B. C.) and you add 900 years to it, you get…. what? 1500 B. C.
I think it’s interesting that the geologists want to argue about it and say that the eruption happened in 1600. Who are we supposed to believe? The people who actually lived during that time or some egg head in an office somewhere, living 3,500 years later? 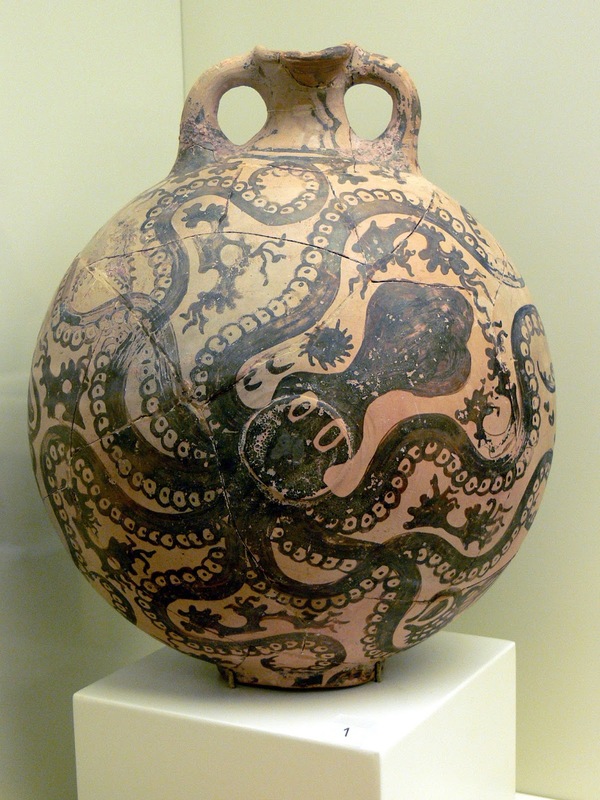 So, one of the bases of the Minoan empire, the island of Santorini, literally exploded with a force that made Mt. St. Helens look like a firecracker. To give you some perspective, it was thousands of times more destructive than the nuclear bomb dropped on Hiroshima and we all know what that did! Six hundred cubic miles of material were expelled, producing a crater 1,000 feet deep. It produced an ash cloud 24 miles high and 120 miles across. It could be seen from Egypt. The sound of the explosion circled around the world 10 to 12 times. It produced what the geologists call an “earthquake storm.” That is, there were a rapid series of earthquakes, one right after another, in magnitudes of 3-5. I understand that every volcano spits out pumice, which is a light, porous, glassy stone formed by violently expelling lava. Each kind of pumice is unique to that volcano alone, like a fingerprint. They have found the unique pumice from the Santorini volcano as far away as the Nile Delta and the Black Sea, a thousand miles away. Interestingly, Dr. Manfried Bietak has found a layer of this pumice at Avaris, a city in Egypt. 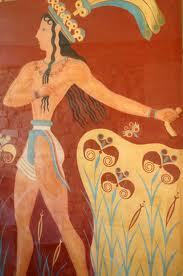 He does not hesitate to date it confidently at 1500 B. C.
This event essentially ended the Minoan civilization. The people on Santorini seemed to have had warning. There were beds dragged out into the street and piled with possessions. 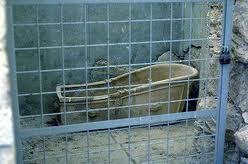 There were houses and tools and other possessions, but no bodies like we found at Pompey and Herculaneum. Remember, it took a day and a night to destroy the island. They had to hurry to get away. 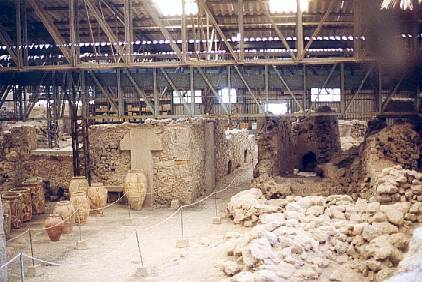 The towns of Santorini were buried in 30-80 feet of pumice (that’s as high as an 8 story building). They would have slowly been buried alive, otherwise. However, even if they did manage to get on ships and get away, there was no way that they could have outrun the subsequent blasts and wave fronts. Their ships would have been blasted as though by modern cannon fire and then the passengers and crew would have been drowned by the tidal waves that followed. The tidal waves, or tsunamis, would have raced across the Mediterranean. Tsunamis can reach unbelievable speeds, as much as 500 miles an hour. The first barrier that the wave front would have encountered is the island of Crete - capital, power base and home to the majority of the Minoan people. There were not just one, but a series of tsunamis. They’ve found evidence for as many as ten. The waves would have run unimpeded across this low island, killing the people, tearing up the towns, orchards and gardens and soaking and re-soaking the fertile ground with salty sea water. In old times, when you conquered an enemy and you really wanted to hurt them, you would “sow their fields with salt.” That is, you and your army would go to every fertile field and spread salt all over it. It makes the ground incapable of growing crops for many years to come, essentially destroying the agriculture, and thereby the food supply and the strength, of that people. 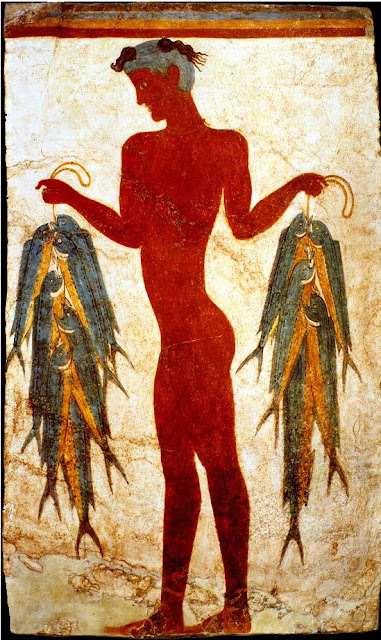 So, within 24 hours, the Minoans went from being a numerous, self-sufficient, comfortable, well-protected, rich people who were one of the major forces in their world, to a few shell-shocked, scattered stragglers who had no food, no hope of growing any food, no homes, few boats and nothing to trade. A few stragglers managed to find refuge in Egypt, which is how the priests of On got their story to tell Solon. Most of them just disappeared into oblivion. I used to wonder why God would do such a thing to these people. I've come to understand that there were multiple things that happened as a result of this catastrophe. 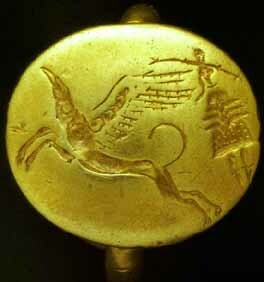 There were a people in Greece at the time, called the Mycenaeans. 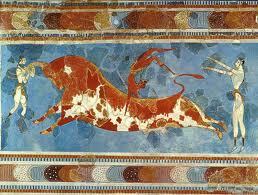 Anybody ever see the movie “Troy?” Well, it was the Mycenaean Greeks that destroyed Troy in that movie. They weren’t what we would think of as Greeks today. They were more like the Vikings, a nation of bandits, who lived by warfare. The Minoans had kept the Mycenaeans under control. 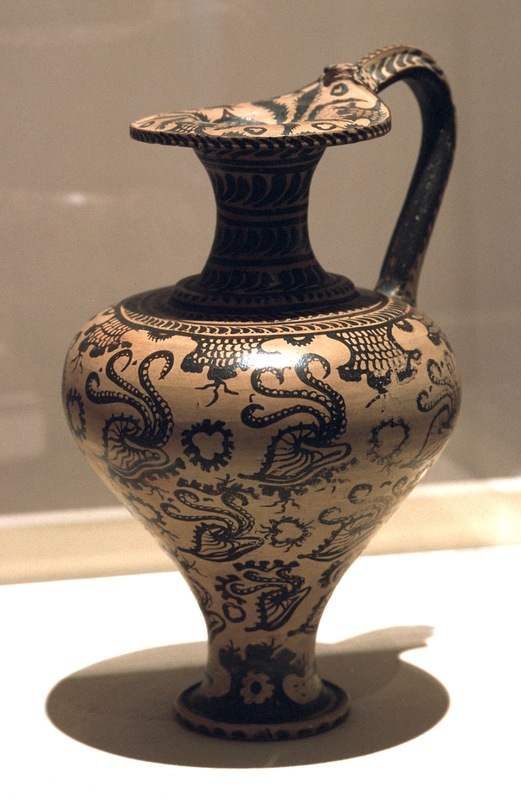 With the sudden removal of the dominating Minoan navy, the Greeks began expanding their power and eventually were an influence throughout the Mediterranean world. Their culture, we know, eventually influenced much of Western thought. In addition, they grew to be militarily strong enough to stop the Persians when they tried to invade and dominate Europe. Without the Greeks doing these two things, our history would have been vastly different, as they insured the foundation and continuation of our Western culture. 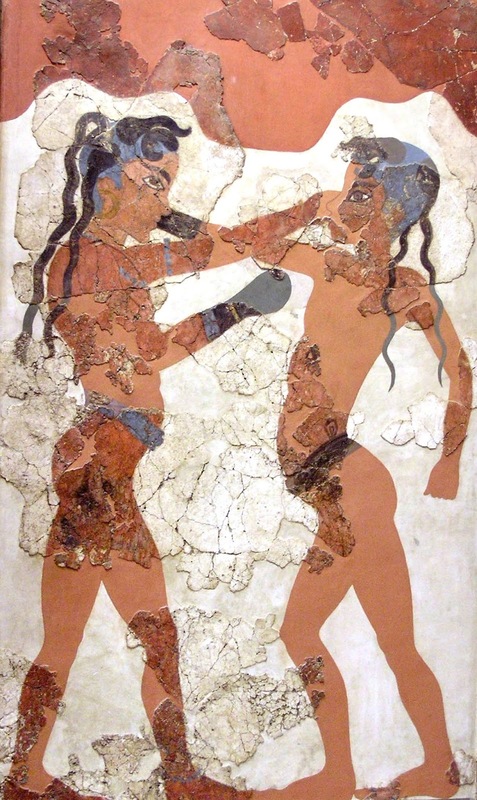 With the Minoans no longer militarily superior to them, the Mycenaens could now do what they had always wanted to do. They invaded Crete and wiped out the few pitiful survivors still there. 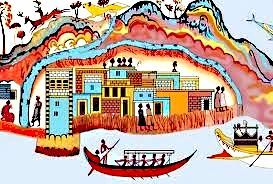 They became Crete, establishing homes and towns there. Unfortunately for them, they got full of themselves and decided they could continue south and invade Egypt. Egypt was more than able to handle them. The Pharaoh of that time didn’t even need to kill them. He repelled their ships and sent them on their way. They had to go somewhere else, so they went east, attacking and supplanting the Canaanites in the coastal area that later came to be called Philistia. What does that have to do with our study? I am firmly convinced that some of the people possessing the surviving technology, agriculture and civilization from the pre-Flood civilization, made their way to an island haven, where they could not be destroyed by the barbarian hordes surrounding them. They were able to multiply and flourish and would have become an unstoppable influence in the affairs of the world. That couldn't be allowed if God's plan for history was to be carried out. The Greeks and the Romans were needed to dominate the Mediterranean area if the Jews and subsequently Jesus were to play their roles in history, as He intended. That could never have happened with the Minoans on the scene. So, they were erased from history so thoroughly that, even today, we have a hard time knowing anything about them. One thing is clear. Once again, there was another highly advanced civilization that had aspects far beyond our own technology, far in the past, where the evolutionary materialists say they should never have been. The evidence continues to mount!